This image taken from the NASA Internet site 28 April, 2000 shows the south polar cap of Mars as it appeared to the Mars Global Surveyor on April 17, 2000. Photo credit: AFP PHOTO/NASA/JPL/Malin Space Science Systems. We are going to jump right in to this story, since it has been out for a week and most people already think they are familiar with this story. The mainstream press appears have missed most of the interesting implications of these recent findings. So, I thought I’d head over to Robots Everywhere LLC to get some clarifications from Matteo Borri. Lisa Rein: Hi Matteo! Let’s talk about the implications of the “lake” they just found on Mars. Does this mean there is life on Mars? Is that all we needed to do; find water? Matteo Borri: No, finding water just means it is more likely. Water does not guarantee life. But it does mean that there is a small chance that something could be alive in there. LR: Were the Italian scientists looking for “current life” rather than “past life?” Is that how they found it? MB: No. They were just looking at what the rock under the polar ice looked like. LR: Where exactly was the lake found? MB: The lake was found in the South Pole of Mars. It’s very cold there. There is about 1.5 miles of ice above the lake. Either enough salts were dissolved by the ice to lower its freezing point, or some source of heat is underneath it, turning it into a liquid. MB: No. More like a big pond or small lake, with a bunch of ice on top. We don’t know how old it is. LR: They weren’t using any special kinds of instruments different from the ones NASA uses? MB: Nope. Same kinds of instruments. It was just the luck of the draw. This sort of under-the-ice brine lake is similar to one found in Antarctica a few years back: and there were viable single-cell critters in it. 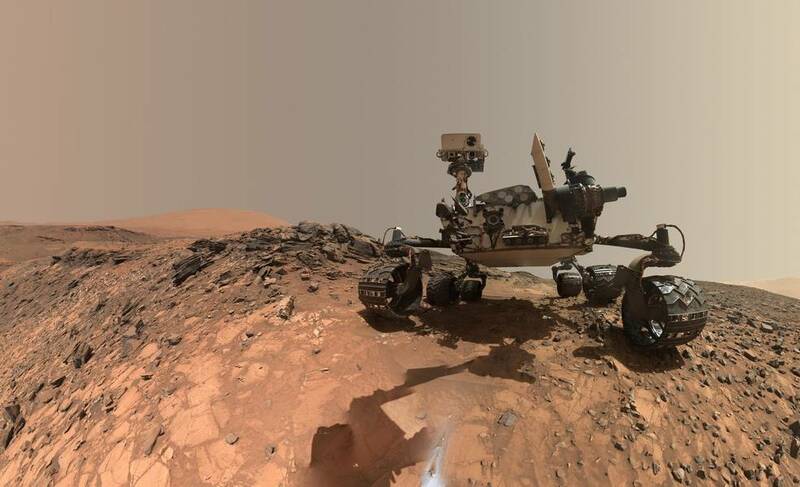 So if Mars ever had pervasive life, like earth does now, some of it may have survived under there. MB: Yes, but it would still need to get its energy from somewhere. And getting energy is harder in general on Mars, compared to Earth, because it only gets about 1/4 of the energy we get from the Sun, and it’s seismically dead so no volcanic vents. LR: You mean from something other than light, right? MB: Yes. Something other than light. So, something that uses something other than chlorophyll and sunlight. For that water to exist underground like that, you have to be getting some energy from somewhere. Light, heat, anything. What do the extremophiles we know about here on Earth use as an energy source? MB: Well, “extremophiles” simply means life that can exist in very harsh environment. One that would normally be too cold, too hot, or too dry for other life. There are some simple life forms that exist near the volcanic vent (where the water goes up to 200 degrees Fahrenheit). An underwater organism in a submarine volcano. LR: And they are “in the dark,” right? No sunlight. LR: So, how do they get their energy then? MB: Using the temperature gradient between the volcanic vent and the surrounding environment. LR: Wow. Could some kind of volcano-based temperature gradient system exist on Mars. MB: Nope. 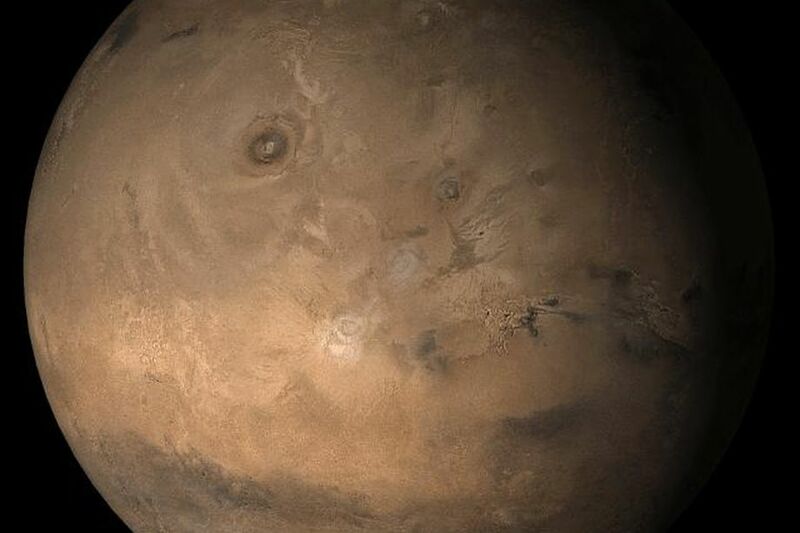 Mars doesn’t have any active volcanoes or seismic activity. Zero. Although, there was a lot of it at some point, but way back when, like billions of years ago. LR: So, the big mystery is what the hell is melting part of the ice into a big lake? LR: What are the theories? MB: Well, the most likely theory is that salts deposits were slowly eaten up by the ice, which lowered its freezing point. Once you get some liquid, it will spread out, making that particular reaction go faster. 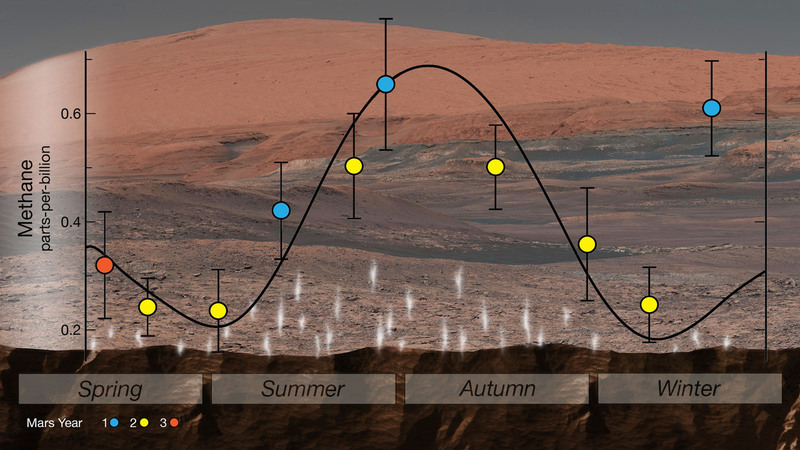 Ask Matteo Borri: What Do The Methane Patterns On Mars Tell Us About The Possibility of Life There? You can see many of Matteo Borri’s creations at Robots Everywhere, LLC. Matteo is an Advisory Board member of the Swartz-Manning VR Destination & co-lead of the Aaron Swartz Day Solar Survival Project. NASA made an announcement recently about its latest finding about Mars. Specifically, they found Methane, which clearly suggests that life is either there now, or was there, a long time ago. Lisa Rein: Matteo, would you please summarize the implications of the Methane material NASA found on Mars? Matteo Borri: Well, we already knew that there is Methane on Mars. What is interesting and new is that we have now figured out it comes out of the ground seasonally. Methane on Earth mostly comes about by biological means, from bacteria, but surprisingly enough, the large share of it that comes out of cows’ hindquarters is enough to muddle the data, so we are not sure about it. However, there is also a seasonal component to how much of it is released in the atmosphere. We now know that Methane is released during the summer and fall. On earth, Methane is also released seasonally. Typically during the end of summer. LR: So is part of the excitement that Mars is exhibiting more Earth-like characteristics? MB: Yes. It’s one more point in common between the two planets. LR: When they say they’ve found “organic compounds” one of the complex molecules required for life,” what does that mean? MB: A methane sink is a type of rock that absorbs methane when the condition for it. Carbonate rocks will fit the bill; so will Granite. LR: What’s the connection between the Tryptophan that we just learned about in the last article, and these “complex molecules required for life” such as Methane? MB: If we find Tryptophan, we know that we’ve got a life sign. Methane is actually a simple molecule, five atoms total, and can come about in an inorganic way. 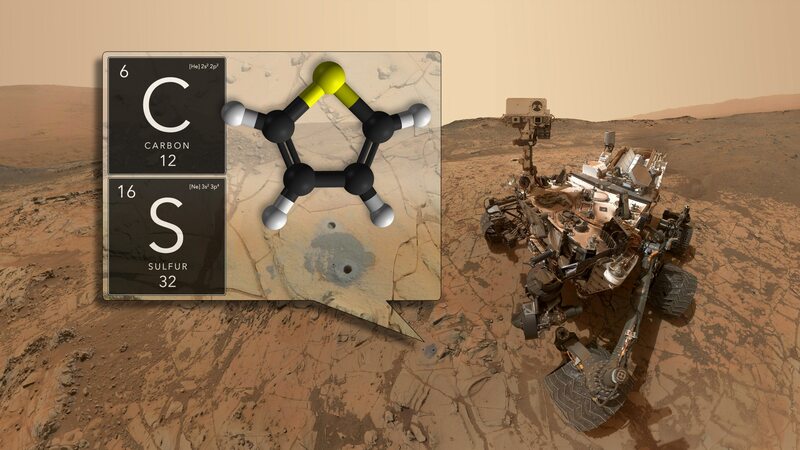 Finding Methane in some parts of Mars, and not others, raises many interesting questions about the Methane’s origin. Might we have stumbled upon ancient Methane deposits from hardy bacteria that are no longer living? Or something else entirely? There isn’t enough data right now. We have to go back and look, but this recent discovery gives us a place to start looking. It’s never a bad thing if you have even a hint of where to land your rover. Congratulations to the Mars Society for reaching its kickstarter goal for MarsVR. The long-term goal of the MarsVR program is to enable you to explore Mars in VR using the same ground breaking VR platform that will be used to train the crew members at the Mars Desert Research Station, an analog simulation of Mars in the Utah desert, organized by the Mars Society. the entire VR environment, including all 3-D models and terrain around the MDRS, will be released under open source licenses to be made available to researchers and the general public. MarsVR will be a fully immersive VR Experience that allows you to explore a simulated Mars environment. The Mars Society is pioneering the use of virtual reality for pre-mission crew training, as well as expanding Mars advocacy and outreach among the global community. Training and documentation will also be provided in the hopes that a whole ecosystem can be built around the project. MarsVR is one of the first projects of its kind, but I believe it is the kind of system that everyone will be building in the years to come. A VR-enabled datasharing platform has implications for just about every area of scientific research, and may just “change everything” by accelerating breakthroughs at an exponential rate (due to everything being open-sourced and shared with the public). Meet James Burk, the IT Director of the Mars Society and the one leading the organization into its first foray of “CrowdExploration“ (an emerging field of collaboration between the first astronauts on Mars and VR experts and enthusiasts back on Earth). James and his team have a few different phases of the project planned. “Phase 1” will focus on designing training simulations for the Mars Society’s Mars Desert Research Station in Utah. The simulations that take place there help to provide crucial information and situation preparedness to the participating MDRS crew members, via analog research and testing. These help prepare future astronauts to learn what they can in a simulated environment and make the most of their time on Mars. The first phase of MarsVR will be focused on the MDRS (Mars Desert Research Station), providing a virtual reality platform for serious research to support the exploration of the “real” Mars in the future. But since it is virtual, we can all come along for the ride. The Phase 1 goal is to build a complete high-resolution simulation of the entire MDRS habitat, both inside and out. This will ship in October, but there should be a beta finished as early as September 2018. A few happy crew members at the Mars Society’s Mars Desert Research Station in Utah. Photo Credit: The Mars Society. A crew looks across the barren landscape of “Mars.” (In the Utah desert.) Photo Credit: The Mars Society.